It’s kind of ironic that the best fish and chips place in town is on rue du marché aux poulets – which means the chicken market. 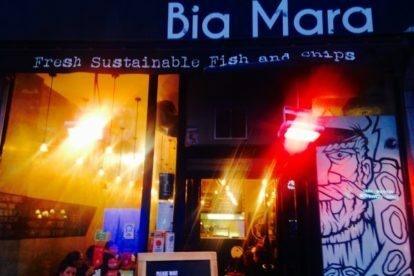 Although they do serve a mean fried chicken tenders option, at Bia Mara it’s all about the fish. And the chips, or course. I love this small restaurant. Casual, minimalist-cool decoration (look up – the ceiling lights are great! ), right in the center of the town – it’s the perfect spot for pre-drinking. They have a good selection of a few fish-batter (“panko” or “tempura”)-sauce combos, all divine. They serve seasonal local beers to accompanied your fish (Brussels Beer Project and Brasserie de la Senne), or some rather nice lemonades. Service is fast and friendly, prices are affordable, and there a nice street-terrace for the warmer days. Just remember that Bia Mara is very popular (for good reason!) and always packed – so be prepared to queue if you want to go for dinner. But it’s worth it.